Forward Corey Horsburgh made his debut for the Canberra Raiders on Sunday night. Photo: George Tsotsos. 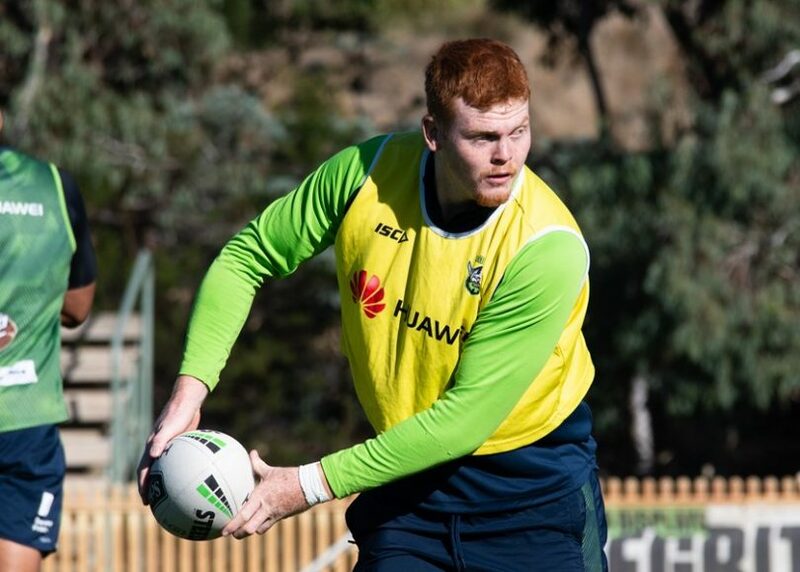 As the redheaded forward Corey Horsburgh took to the field in the lime green on Sunday night (17 March), the camera panned to a man in a rain coat, smiling from ear to ear. Dressed in the lime green shirt covered with green pineapples and the Raiders logo, Rick Horsburgh was the happiest man on the Gold Coast. And so he should be, as his son made his NRL debut for the Green Machine in a 21-0 win over the Gold Coast Titans. 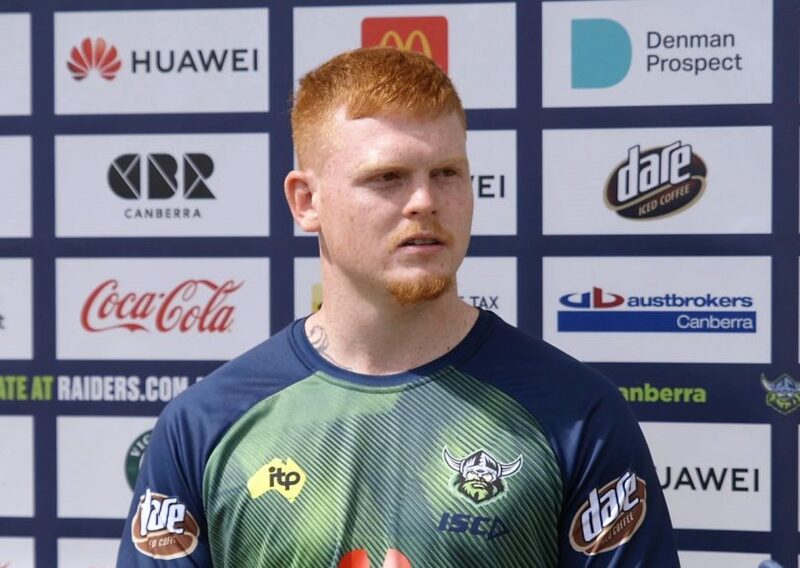 The 21-year-old, who grew up in Brisbane and joined the North Queensland Cowboys when he was 17, joined the Raiders on a development contract last season and was expected to play reserve grade to start the 2019 season. But after a massive preseason and impressive trial performances, he got the nod from Ricky Stuart to make his debut. Horsburgh said he was still pinching himself to assure that his dream really did come true. “It was definitely a dream come true. I am still pinching myself a bit,” Horsburgh said. “It was a bit more intense than I expected and it was definitely quicker, even though it was wet but I loved every second of it. “I think my dad loved it just as much as I did. To see him happy makes me very happy. I tried not to look over at him during the game, he makes me laugh half the time. Photo: Supplied by Canberra Raiders. The only thing running through his head as he took to the field in the rain-sodded CBUS Super Stadium was to not let his teammates down. “I didn’t want to let anyone down and I wanted to live up to the expectation and get through my first game,” he said. “I made a few mistakes but I tried to do my best. Coach Ricky Stuart gave the young forward a simple goal – run hard and tackle hard – both of which he did with aplomb and he has been rewarded with a spot on the bench against the Melbourne Storm on Friday night (22 March) at GIO Stadium. The former Queensland under-20s representative will have the chance to test himself against some of the best forwards in the game in the Bromwich brothers and Nelson Asofa-Solomona, and the fiery forward is relishing the opportunity. “It’s a good opportunity because they are the benchmark in the competition most years, so if I can match it with them I can match it with anyone,” he said. Raiders squad: 1. Charnze Nicoll-Klokstad, 2. Nick Cotric, 3. Jarrod Croker (c), 4. Joey Leilua, 5. Jordan Rapana, 6. Jack Wighton, 7. Aidan Sezer, 8. Josh Papalii, 9. Josh Hodgson (c), 10. Dunamis Lui, 11. Joe Tapine, 12. Elliott Whitehead, 13. John Bateman. Interchange: 14. Siliva Havili, 15. Ryan Sutton, 16. Sia Soliola, 17. Corey Horsburgh.